We have a quickie today - I slept in till 0600 because that's what I wanted to do. The dogs are just as lazy. We have a drizzly, rainy day outside - temp is supposed to hit 79 (F) maybe, right now it's 66 (F). The back door is standing open. There is all sorts of Idiot Jerk news. He said something racist yesterday (what else is new) and his party stayed... silent. They don't want to criticize him lest they make him angry. Not doing so is going to cost them more and more seats in the house. They are terrified they're going to lose power if he Tweets against them. They are the perfect example of Catch 22: damned if they do, damned if they don't. They just cannot get the thought through their heads that as a party, they are damned. Today is a bit of special day. Both my brother and his wife have a birthday. I always kid him because today is Bill Clinton's birthday, too. Being Evangelical Christian Conservatives, he is the 2nd worst human being every to have sat in the White House, the worst was Obama. But that isn't what makes today so great. Today is Lily's birthday as well. She is 5 years old, and the perfect little Lady. On my way home from work I'll pick up white cake and vanilla ice cream so we can have a party. Of course, she doesn't know today's her birthday. But that's okay. She's a dog. I don't expect her to remember little things like that. 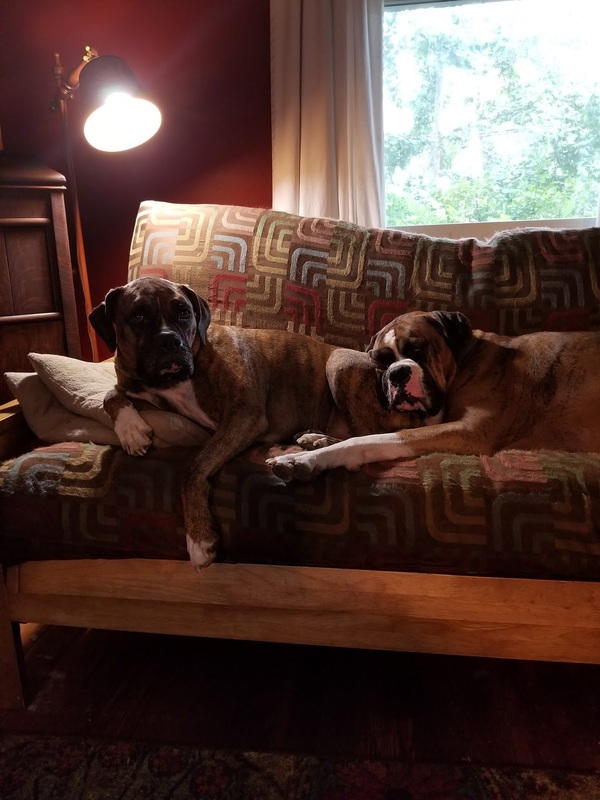 What a great picture of your dogs. They look very comfortable on the couch! HAPPY BIRTHDAY LILY! and to bill clinton too! screw your brother and the orange muthafucka too! our furkids are spoiled because they love us beyond all measure. Lily says thanks, so does Bill. Now, if you'll excuse me, I've got to go cut the cake. Happy Birthday Lily! Will she get a piece of cake? It's only fair!